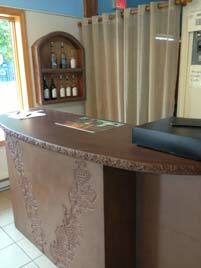 Visitors seeking tastings at the Charis Winery in Cumberland, Maryland are sure to notice this grape-themed custom concrete bar as they swirl and sip their wine. Commissioned with this project, Jim Koon and his team with Mountain Men Custom Creations of Keyser, West Virginia emphasized this theme with bold grape vine impressions in the front and with a vine detail in the bar top edge profile. Actually a surround for a cabinet, Jim chose SureCrete Design Products’ Xtreme Series GFRC Mixes to construct a sturdy and durable concrete bar. The bar top is a 2” thick, but was made to be lighter than expected due to its’ particular layered construction. With the vine profile in place, Xtreme Series Face Mix was sprayed into the countertop form to provide a shell. Then, ½” of Xtreme Series Backer Mix was packed in followed by (this really helped to lighten it up) a layer of 1” foam which was encased with a troweled on application of Xtreme Series PreCast. The base of the bar is made up of three pieces: the center is “U” shaped and the other two “L” shaped, flanking either side. The vine stamps were placed in the forms and the resulting impressions were easily tidied up with a rotary tool. The Mountain Men team added Integral Color packs to the Xtreme mixes and, to get the best match possible, it was also added to the caulk that was applied to the seams on the base. Food safe and stain resistant (ideal qualities for a bar), XS-327 Hybrid Water Based Polyurethane was used to seal the concrete bar. To tie in with the custom bar top, a cherry wood display case was constructed and faced with SureCrete Xtreme Series PreCast cast with the same grape vine edge detail as the bar. 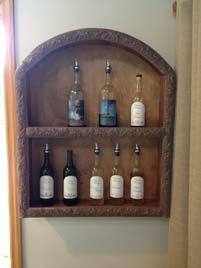 After about 35 – 40 hours the project was complete and ready to be admired by eager wine tasters!